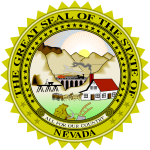 The Nevada Durable Medical Power Of Attorney Form allows a appointed agent, who is the authority over the principal`s medical health care wishes,to make decisions over the patient`s medical treatment should they become incapacitated. To be legal the document requires either a notary or two witnesses. The document is in accordance with statute §162A.700 to .860. 1) The principal must enter theirs and the agents details. 4) The principal must state if they require the agent to follow any specific instructions or restrictions. 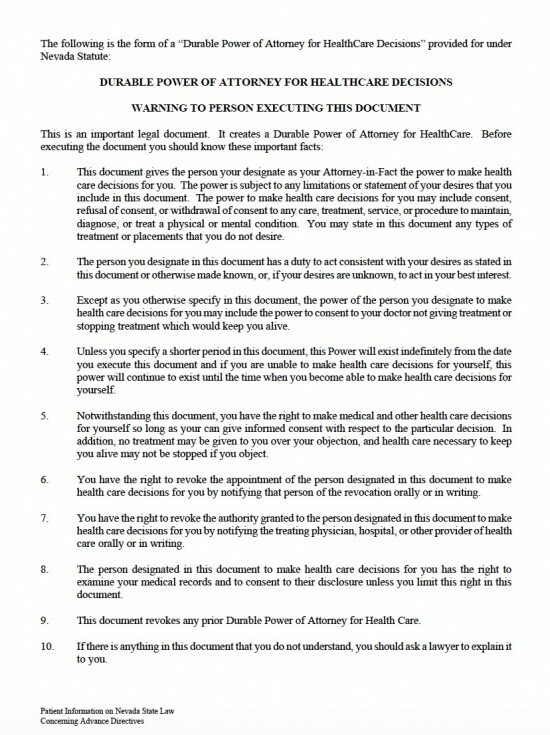 5) The date the power of attorney is valid until is to be entered. 6) The principal must initial the relevant statements they wish to be applicable to their medical health care. Life to be prolonged the the greatest extent possible. If in an irreversible coma life prolonging treatment be withheld. If suffering a terminal condition or with no long term chance of recovery, life prolonging treatment be withheld. Artificial nutrition and hydration to be provided after all other treatment is withheld. Withhold or withdraw treatment if the burdens outweigh the benefits, leaving the agent responsible regarding relief from pain, the quality of extended life, preservation and restoration of function. The principal must enter details of any other desires. 7) The principal must enter the details of any alternative agents. 8) The principal must enter their details to revoke the power of any previous power of attorney. Details of a notary must be entered. The witnesses must enter their personal details. At least one of the aforementioned witnesses must enter their personal details.